Ever wonder why Seattle has a park called Gas Works Park? Here’s your answer. After 50 years of operation, the Seattle Gas Light Company’s gasification plant began its conversion into one of the most iconic, quirkiest public parks in the country in 1956. Purchased by the City of Seattle, and designed by award winning landscape architect Richard Haag, the park pays homage to the history of the gas plant by maintaining a variety of its original towers, tanks and pipes. Many of these structures were transformed with paint, or were refurbished to create a more playful aesthetic, and to encourage people of all ages to explore the plant’s grounds. On a sunny Seattle afternoon, you’re sure to find kids and adults alike dodging through the relics of the plant’s various arches and pillars. Just down the hill from the ruins, lies a more open, expansive green space, often populated by kite-fliers, frisbee tossers and picnickers. This verdant field ultimately opens up to a gently sloping man-made hill that’s topped with a stunning, 28 foot sundial. Covered in various materials, from shells, to bronze flecks, to ceramic pieces, this multi-colored masterpiece engages visitors by allowing them to become the clock’s crucial time-telling centerpiece—the “gnomon.” In this way, visitors insert themselves into a single moment in time, and become a small piece of the park’s rich history. 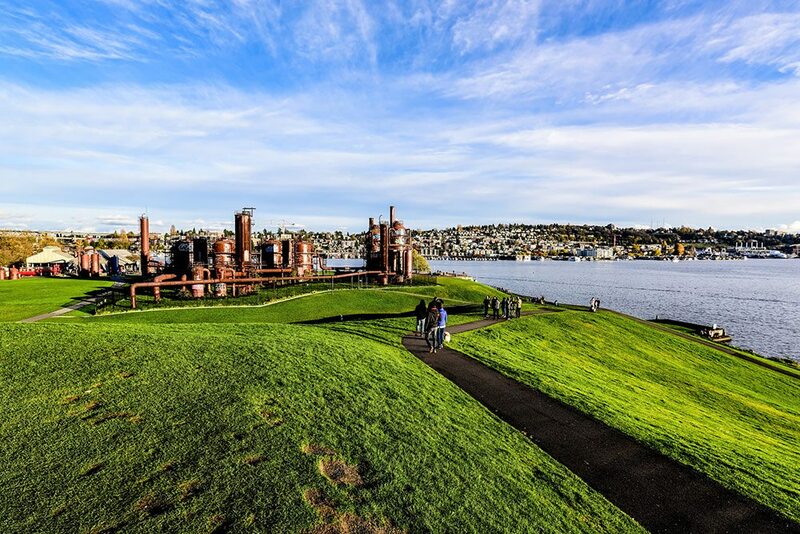 At first glance, Gas Works Park feels cold— a little too stiff and industrial. But an afternoon spent lounging on its lawn and exploring its design is sure to change your mind. If you make an effort to linger at the park while the sun begins to set, prepare to absorb one of the most gorgeous views you’ll find in the city. Jutting out into Lake Union, it yields breathtaking scenes of the quintessential Seattle skyline. For more information, visit the Gas Works Park website.